"At the same time, 1966 was the year when the unrelenting, accel­erating pace of sixties pop -- three singles a year, one or two albums, hundreds of live dates, television shows, radio commitments, photo shoots, foreign tours -- began to catch up with many of its leading protagonists. It wasn't just the constant pressure to come up with hits and enforced intimacy that did for these musicians; it was the unprecedented nature of their global fame, the sense of being pro­pelled far from any familiar shore. "By August, America was the source of half of the records in the UK Top 50. 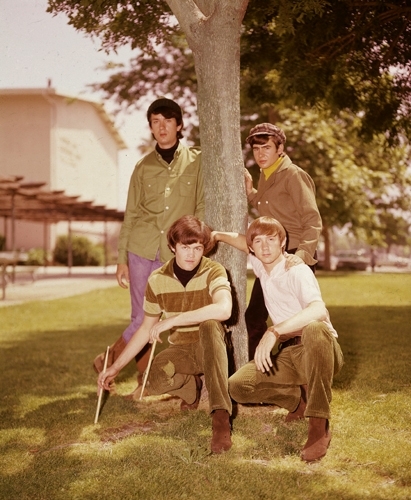 As well as what the NME called 'the sudden Tamla Motown comeback', the new threat came 'from the new school of West Coast groups -- the Beach Boys, the Lovin' Spoonful and the Mama's and Papa's'. At that point, West Coast still meant Los Angeles and, as if to seal its position as the centre of the pop uni­verse, the city came up with the next Beatles right on cue. "Pop abhors a vacuum, and just as the originals disappeared, their simulacrum was heavily promoted by a full-page ad in Billboard: 'A different sounding new group with a live, infectious feeling demonstrated by a strong rock beat'. 'Last Train to Clarksville' was the first single by the Monkees, the four-man group assembled, after a long period of research and development, to star in a Hard Day's Night-type TV series. The timing was perfect. Touted as 'the spirit of 1966', the four good-looking group members reproduced the elements of the Beatles' unified 1964 camaraderie. An infec­tious acrostic of 'Paperback Writer', 'Last Train to Clarksville' was released four weeks before NBC's premiere of The Monkees. With its crackling performance and Vietnam-timely theme of unwilling partings, it entered the Top 40 a week after the series premiered -- the start of a three-month run that would top out at #1. "It was a great record, but it also contained a clear message: if the Beatles weren't around, they would be cloned by the industry. And the younger teens would hardly care: 'I luv 'em,' said a reader polled by KRLA Beat after the show's premiere. 'Mickey and Mike are so funny and Davy's so cute and Peter's just so ... ' As another commented: 'I thought the show was great. It's kinda like A Hard Day's Night but it's even better because it's in color and we can see it every week.' "